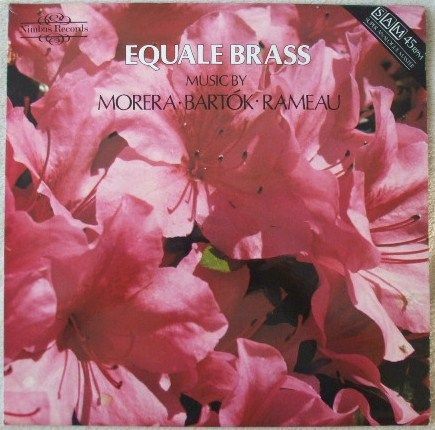 45rpm LP Record of Nimbus 45010 EQUALE BRASS (Music by Morera, Bartok, Rameau), featuring John Wallace & John Miller on trumpet, Michael Thompson on horn, Peter Goodwin on trombone and John Jenkins on tuba. It was issued on the Stereo Nimbus Records label in 1981 (Super Analogue Master). UK pressing. The record itself is graded at least excellent, with no visible surface marks when viewed under normal house lighting. Play-tested on an AIWA turntable. Superb sound quality, with NO jumps, pops, ticks or crackle. Just about faultless playback. Minimal to no spindle wear. Labels very clean, a couple of very light spider marks. The outer sleeve is also graded at least excellent, with no more than very light wear. The spine is intact and strong with no loss to the lettering. The inner sleeve has no wear to speak of.